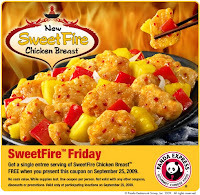 It’s Free: Panda Express & Mrs. Fields! October is National Cookie Month and on October 1st Mrs. Fields locations will be giving away Free Chocolate Chip Cookies…Yummmmmmmmmm! CLICK HERE to find a location near you! York Photo – 50% Off ALL Poster Orders! Stork Craft Aspen 3 Drawer Dresser just $105 Shipped!